All over the world property owners are always looking for more energy efficient ways to heat their homes. This can be for their financial savings or the benefits this gives to our environment as a whole. One of the “green” heating options that seem to be growing in popularity over the past few years is the use of Thermodynamic Panels and central heating management systems. Thermodynamic panels are being used in more and more homes and businesses around the world to cover all of the hot water needs for the property. The system is seen as a great improvement on solar panel systems, with the thermodynamic panels not requiring sunlight in order to function. Instead, the system benefits from ambient air temperature as well as solar radiation, allowing it to generate hot water 24 hours a day, even in colder climates. When the first thermodynamic panel based systems first came onto the heating scene, there was a fair amount of scientism around the heating and money saving claims. This type of heating system can now be found in properties around the world, backing up many of these claims. At the start of 2016 confidence was cemented for this amazing product, with the first thermodynamic systems being granted the Microgeneration Certification Scheme (MCS) approval. This shows that these products have passed a number of technical tests to prove their claims. How do Thermodynamic Panels systems work? Thermodynamic is a scientific term used to describe heat energy and it’s movements. In basic terms the thermodynamic panels work by passing a very cold liquid around a panel on the outside of your property, gaining heat from the warmer outside temperature. The liquid refrigerant is a staggering -22°C when it is first pumped into the panel. Starting with such a cold temperate, as the liquid passing around the panel, even the slightest external temperate raise above this would work to raise the temperature of the liquid. By the time the liquid has travelled around the panel its temperature would have raised to -15°C, this is the temperature at which the liquid would reach “boiling point” and vaporise into a gas form. Obviously, the higher the outside temperature the quicker the liquid will reach its ideal temperature for you, so a sunny warm climate will help, but the main fact is that it is not essential. Any raise in temperature will allow the thermodynamic panels to work making them perfect for properties around the world, no matter the weather. The panel has now completed its side of the task. The newly formed gas now leaves the panel and returns to the compressor within the thermodynamic unit. This compressor will pressurise the gas into a heating element or “heating plate”. As the gas is compressed it creates heat energy, it is this heat energy that is then passed through and used to heat your water supply. Once the has loses it’s new found heat, it is expelled through an expansion value relieving the pressure and allowing the gas to return to its liquid state. The entire process starts again giving a continuous supply of heat and hot water for your property. 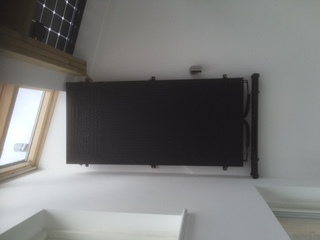 Thermodynamic panels can be used by installing the thermodynamic panel with a thermodynamic unit to your property. This will then allow the heat created by your thermodynamic system to heat your water supply from your existing cylinder. This can be a very cost effective way of trying the thermodynamic panel system for your property as you do not need to replace your existing cylinder, the thermodynamic unit will just connect directly into your existing cylinder to supply your hot water. 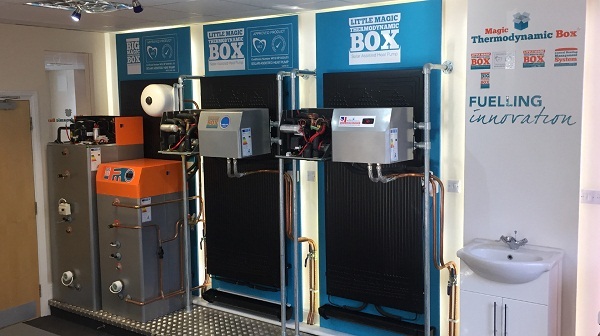 There are now all in one thermodynamic panel systems available, that bring together the thermodynamic unit and the cylinder to give you everything you need to heat your hot water from your thermodynamic panels. This is a great idea, with your entire system working together, perfect if you are short of space and want to keep everything tidy, together and out of the way. The all in one system is a fairly new product to the market, but you can already find companies supplying them with a MCS rating to give you total peace of mind that the products have been highly tested and are proven to work.